For our Toronto bootcamp, we offer 5 separate packages for each day of our public 5-day bootcamp, or you can register for the full 5-day bootcamp as a bundle! 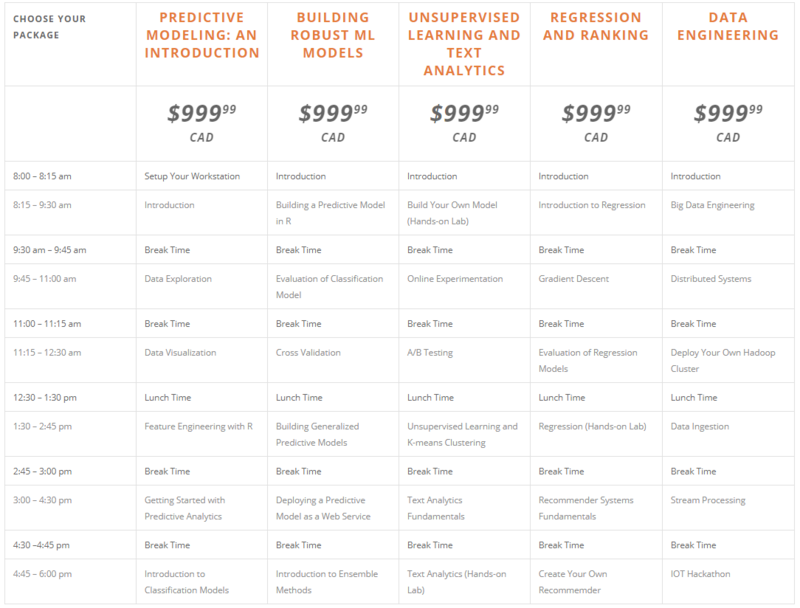 Compare options for the Toronto Data Science Bootcamp Curriculum is covered in 5 day-long courses. For a deeper dive into the modules that are covered each day, take a look at our curriculum! Register for all 5 days and get 30% off! You can compare this bundle to our Guru package. The 5-day bootcamp runs Monday, August 19 – Friday, August 23, from 8am – 6pm, with breakfast, lunch, and a morning and afternoon break each day. Not sure which package to sign up for? Speak with an instructor!